Nearly 1 In 10 Children Does Work That Threatens His Health Or Education : Goats and Soda A report from the U.N.'s International Labour Organization looks at how many children work, what kind of jobs they perform — and how to stop it. 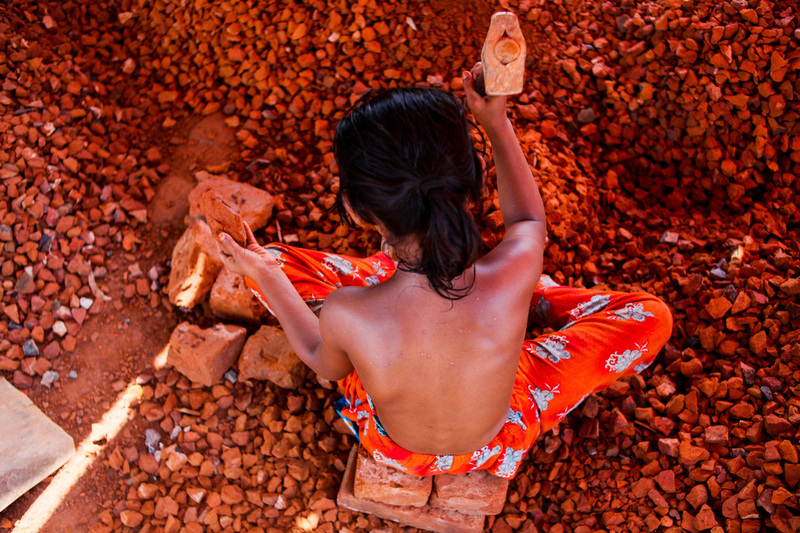 A Bangladeshi child works in a brick-breaking yard in Dhaka, Bangladesh. The broken bricks are mixed in with concrete. Typically working barefoot and with rough utensils, a child worker earns less than $2 a day. 1. This isn't about a kid doing a few chores on the family farm after school. It's worth noting that these statistics only cover children who are doing work that is hazardous to their health or that prevents them from attending school full time because of the hours involved or the nature of the job. So it does not include, for instance, 12- to 14-year-olds doing nonhazardous, "light" work for fewer than 14 hours a week. 2. There's been progress on this issue, but it's slowing. Two years ago the world's leaders pledged to end child labor by the year 2025. But while the share of kids engaged in child labor has dropped substantially over the last decade and a half — from 16 percent in 2000 to 9.6 percent in 2016 — the decline has been slowing in recent years. And at the current rate of decline, by 2025 there will still be 121 million children involved in child labor. 3. A lot of the children who are working are very young. Almost half of the children engaged in child labor in 2016 — 72.5 million — were between the ages of 5 and 11. And there was almost no decline in their numbers over the last four years. 4. The problem is particularly severe in Africa. Nearly 1 in 5 children in Africa is engaged in child labor. That is the highest share of any region and way ahead of the next highest, Asia and the Pacific, where about 1 in 14 children does this sort of work. Progress in Africa has also been particularly limited: In fact, over the last four years the share of children working in Africa actually edged up slightly. 5. Boys seem to be more at risk than girls — or are they? Nearly 60 percent of child labor is done by boys. But the report cautions that this may reflect underreporting of domestic work done by girls. 6. Most of these children work in agriculture. Just over 70 percent. This includes not just farming but also fishing, forestry and livestock. 7. Almost half do work that is hazardous. The report classifies work as hazardous either because the occupation is itself harmful — for instance, carrying heavy loads, working at dangerous heights or with dangerous machinery or with hazardous substances — or because the working conditions, such as night work or excessive working hours, put children at risk of injury. 8. Laws are not enough. The report argues that laws are crucial. But it also notes that practically every country in the world has already signed international agreements prohibiting child labor. Just as key is for countries to enforce existing laws and to provide two benefits shown to have a major impact on reducing child labor: educational opportunities for children and economic opportunities for their parents.